These Bottle Retention Straps can be used on any of the VintageView ™ lines of wine racking, these straps are designed specifically for standard size wine bottles. These important accessories secure bottles to VintageView Wine Racks. These straps are made from an extremely strong and highly durable rubber, and provide excellent piece of mind in places where your collection may be subject to excessive vibration or movement. A welcome addition in regions prone to earthquakes. Recently redesigned the BRS is an even more secure solution for your wine bottles. 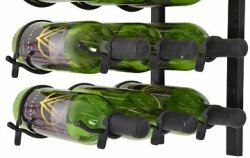 These improved straps even secure the bottles hiding in the second or third row of your VintageView Wine Racks. The new design includes a steel clip that is embedded into the rubber strap so it does not damage the bottle labels. Each set secures a single wine bottle, and includes 1 base strap and 1 neck strap. The straps are available in black. FREE SHIPPING ON THE ACCESSORIES WHEN ORDERED WITH OTHER RETAIL RACKS. Shipping charges will apply if ordered separately, you will be notified of cost.